The largest known Fremont Indian village ever discovered came to light during construction of the I-70 through Clear Creek Canyon, about 21 miles southwest of Richfield. Fremont Indian State Park and Museum preserves and protects pictographs, petroglyphs and other artifacts left behind by the Fremont when they lived here about 1,000 years ago. Inside the Museum are arrowheads, pottery and baskets found at the ancient site in Clear Creek Canyon. Starting in about 1400 CE, the Paiute Indians traveled through the canyon between their ancestral hunting areas on opposite sides of the Tusher and Pahvant mountain ranges. There are a number of rock art panels in the canyon that have been attributed to them. Jedediah Smith first traveled through the canyon following the Paiute Trail in 1826. In 1872, Mormon pioneers made the trail into a toll wagon road ($0.25 per wagon) and collected on their labors for 25 years. 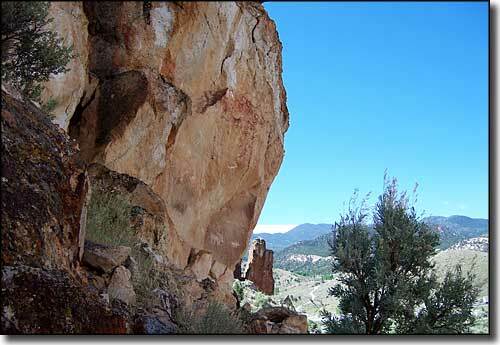 In 1877, John Smiley Lott and his 2 wives were the first year-round homesteaders in the canyon. They built a school in the canyon for their grandchildren in 1895. The discovery of gold at Kimberly in the 1890's made the wagon road an important route to the railhead at Sevier. 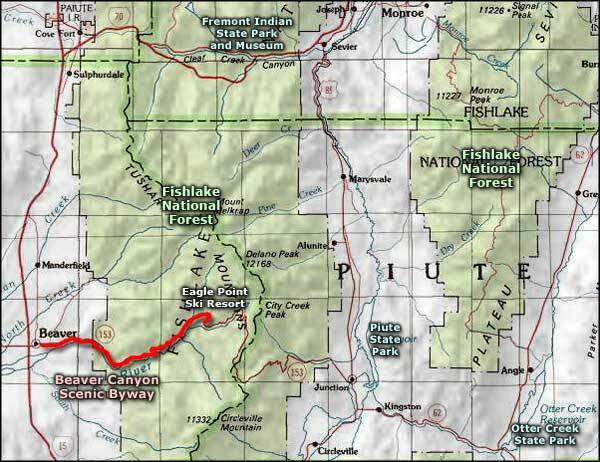 In the 1970's and 1980's most of the modern residents left because of the construction of I-70 through Clear Creek Canyon. The State Park and Museum opened to the public in 1987. The Visitor Center and Museum are open 9 AM to 6 PM in the summer and 9 AM to 5 PM in the winter. The park is open every day except Thanksgiving, Christmas and New Year's Day. Day visits cost $5 per person, overnight camping at Castle Rock Campground is $13 per night. Access is directly off the I-70 as it passes through Clear Creek Canyon. Upper photo is in the Public Domain.